Ahi Surf - our version of the modern fish surfboard from Kevin Seid Designs / Shapes: drop-deck pinch rail, fish tail and mouth for agile turning, multi-fin options from twin keel to a five fin that will give you great performance and the ability to customize the fin setup to whatever kind of surf is happening that day and given your unique abilities. 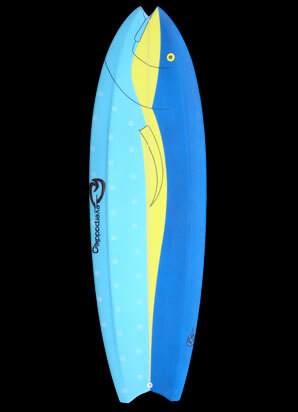 This board has been one of our most popular models. Order one today 3-6" shorter than your shortboard. Pictured: Big Guy Ahi Surf 6'2" x 22 1/2" x 2 1/2". Eco-epoxy construction and 100% recycled foam certified by sustainablesurf.org. Contact us for any help you may need in dialing in your custom board. Prices start at $590.